This batch uses the 2017 vintage which was a fantastic year and the extract and FAN numbers are amongst the highest we’ve produced. We’ve named it Bow Bayern after the Bavarian region of Germany. The taste profile is robust and malty, reminiscent of a Maris Otter English-styled malt. We hope you enjoy working with this malt as much as we have! Bow Barley was named after the river that flows out of the Rockies into the South Saskatchewawn and eventually through Manitoba. It is a truly western Canadian barley, created at the University of Saskatchewan. 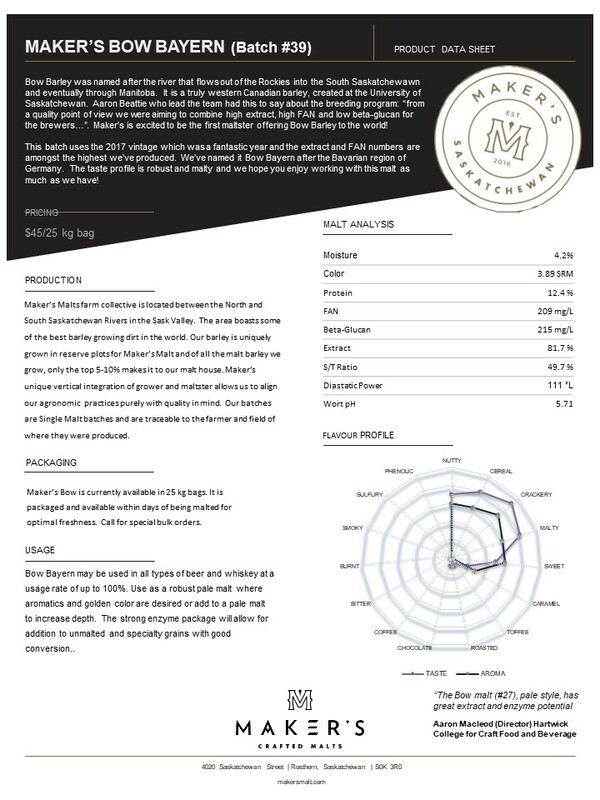 Aaron Beattie who lead the team had this to say about the breeding program: “from a quality point of view we were aiming to combine high extract, high FAN and low beta-glucan for the brewers…”. Maker’s is excited to be the first maltster offering Bow Barley to the world! Bow Bayern may be used in all types of beer and whiskey at a usage rate of up to 100%. Use as a robust pale malt where aromatics and golden color are desired or add to a pale malt to increase depth. The strong enzyme package will allow for addition to unmalted and specialty grains with good conversion..